Extreme policies that would raise objections in typical times can be swept into law in the "we have to do something" panic of a crisis. The Federal Reserve and other central banks are ready for bubble-related financial crises. But what if the current speculative credit bubbles in junk bonds, stocks and other assets don't crash into crisis? Thus, wily insiders await (or trigger) a crisis, which creates an opportunity for them to rush their self-serving "fix" into law before anyone grasps the long-term consequences. Speculative credit bubbles inevitably deflate, and this is universally viewed as a crisis, even though the bubble was inflated by easy money, fraud, embezzlement and socializing risk, and thus, was entirely predictable. A slow, steady decline is precisely what we can expect in an era of credit exhaustion, which I've covered recently ("The Coming Global Financial Crisis: Debt Exhaustion"). 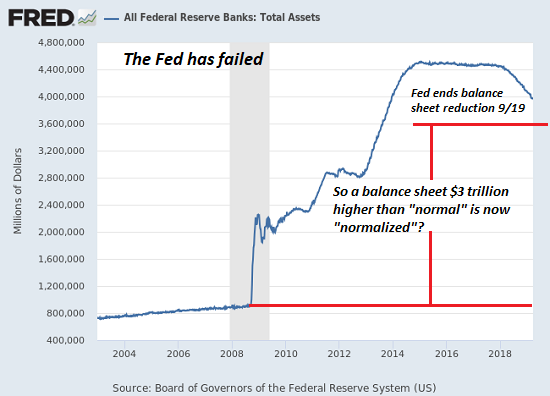 The central bank "solution" to runaway credit expansion that flowed into malinvestment was to lower interest rates to zero and enable tens of trillions in new debt. As a result, global debt has skyrocketed from $84 trillion to $250 trillion. Debt in China has blasted from $7 trillion 2008 to $40 trillion in 2018. A funny thing happens when you depend on borrowing from the future (i.e., debt) to fund growth today: the new debt no longer boosts growth, as the returns on additional debt diminish. This leads to what I term credit/debt exhaustion: lenders can no longer find creditworthy borrowers, borrowers either don't want more debt or can't afford more debt. Whatever credit is issued is gambled in speculations that the current bubble du jour will continue indefinitely - a bet guaranteed to fail spectacularly, as every speculative credit bubble eventually implodes. As expanding credit no longer generates real-world growth, growth slows. Over time, marginal borrowers default as revenues and profits erode, and this triggers a corresponding erosion in employment and wages. This erosion is so gradual, it doesn't qualify as a crisis, and therefore, central banks can't unleash crisis-era fixes. Not only do they lack the political will to launch extreme policies in a moderate decline, it would be unwise to empty the tool bag of extreme fixes at the first hint of trouble; what's left for the crisis to come? Even worse, if the extreme policies fail to restore rapid growth and, more importantly, confidence in future rapid growth, then ramping up extreme policies will be correctly interpreted as the desperate acts of clueless authorities. This will crush confidence and trigger the very crisis the authorities sought to forestall.